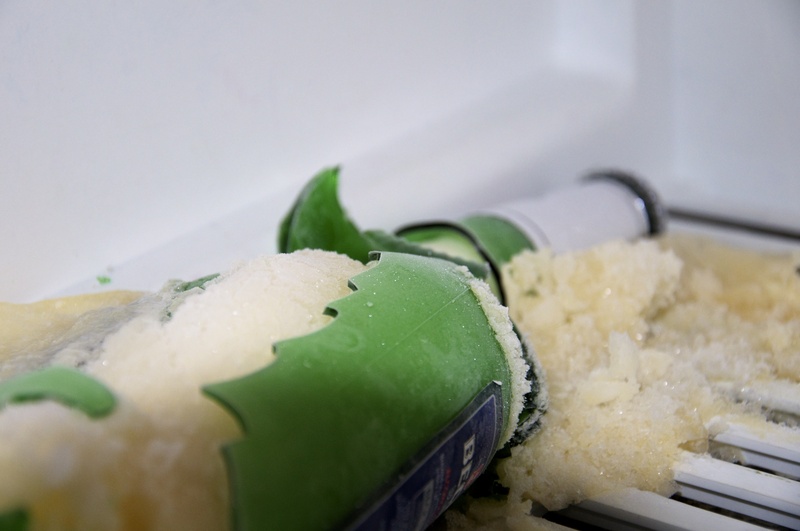 Now you know what happens when you freeze beer. I recently did this… Great pic. Thanks. It’s sort of freezer art, in a way. Yep, did this with a glass bottle of Diet Coke, a day later there was a huge explosion in the freezer, still digging out fizzy ice. Whoopsie but it has to be done. Ouch. The funny thing is I never noticed an explosion or anything; I don’t know if it happened slowly or in one big burst. It was a mess to clean either way, of course. I used to do this with Smirnoff Ice and the bottles didn’t explode. The stuff didn’t even turn solid until I opened the bottle, but then (and only then) the top would freeze into an ice cube, trapping all the liquid inside. Ha – that’s amazing! I guess the alcohol content is just enough to stop it from completely freezing up. I should point out this was non-alcoholic beer, so that probably explains why it froze so readily. I might have to try that with Smirnoff Ice now. Always funny – especially when it happens to someone else!